With a series of exceptionally new translations of Jacques Lacan and Jacques-Alain Miller, The Lacanian Review takes you into the space of the real unconscious and the last teachings of Lacan reinterpreted to approach the urgency of our contemporary moment. There is not a moment to lose. The acceleration of culture and the vertiginous pressure of the drive seem to collapse the instant to see, the time to understand and the moment to conclude. The urgent subject of the now cannot catch up to rapid cycles of political upheaval and social media streams turned into torrents of data. Production overflows consumption in a tidal wave of imaginary cacophony. How does psychoanalysis today respond to urgent times? 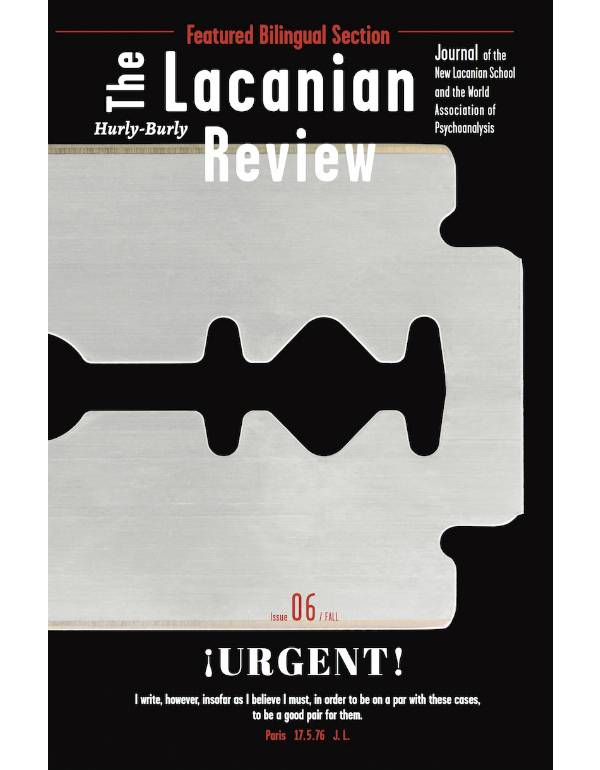 For its 6th issue, The Lacanian Review (TLR) tasks the signifier, Urgent!, to orient the work of the New Lacanian School (NLS) in examining the urgent cases that occupy our clinic in preparation for the 2019 NLS Congress in Tel Aviv: ¡URGENT! Tracing the edge of the latest Lacan, Bernard Seynhaeve (President of the NLS) curated a series of newly established texts by Jacques Lacan and Jacques-Alain Miller, translated by Russell Grigg, appearing in the first ever bilingual featured section of TLR. Four lessons from the seminars of Jacques-Alain Miller frame this issue. Avec une série exceptionnelle et en version bilingue de textes de Jacques Lacan et de Jacques-Alain Miller, The Lacanian Review nous plonge dans l’espace de l’inconscient réel, celui du dernier Lacan, réinterprété pour cerner au plus près l’urgence du moment présent.